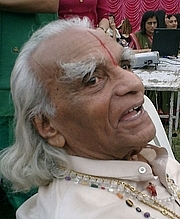 B. K. S. Iyengar has 1 media appearance. Bellur Krishnamachar Sundararaja Iyengar, (generally known as Yogacharya B. K. S. Iyengar) (Born December 14, 1918 in Bellur, Kolar District, Karnataka, India) is the founder of Iyengar Yoga. He is considered one of the foremost yoga teachers in the world and has been practicing and teaching yoga for more than 75 years. He has written many books on yogic practice and philosophy, and is best known for his books Light on Yoga, Light on Pranayama, and Light on the Yoga Sutras of Patanjali. He has also written several definitive yoga texts. Iyengar yoga centers are located throughout the world, and it is believed that millions of students practice Iyengar Yoga. He was awarded the Padma Shri in 1991, and the Padma Bhushan in 2002. In 2004, Iyengar was named one of the 100 most influential people in the world by Time Magazine. B. K. S. Iyengar is currently considered a "single author." If one or more works are by a distinct, homonymous authors, go ahead and split the author. B. K. S. Iyengar is composed of 11 names. You can examine and separate out names.